Another reason why I quickly grew fond of Bali is because of its wide selection of outdoors activities and gorgeous forestry. The island, which is by no means small, boasts ten mountains and four lakes in the north side and a large national park on the northwestern tip. All around this area there is plenty of breathtaking nature to take in, so I am dedicating this post and the next to introduce some of Bali’s great outdoors, one weekend itinerary at a time. Last year, when I was in Bali for only two months and didn’t know yet that I would return, several friends and I decided we must hike a mountain peak before leaving. We chose Mt. Batukaru simply because we wanted to avoid the high fee of Mt. Agung’s trekking guides, as Mt. Agung is the tallest and the most popular mountain among hikers in Bali (and according to the locals, the holiest). Mt. Batukaru is the second tallest mountain with a temple at the peak and a significantly lower number of visitors per year, so we all agreed on it. We then got to work and rented a car and driver for two days. We also booked a room at Prana Dewi, which is located right at the foot of Mt. Batukaru, for Saturday night. 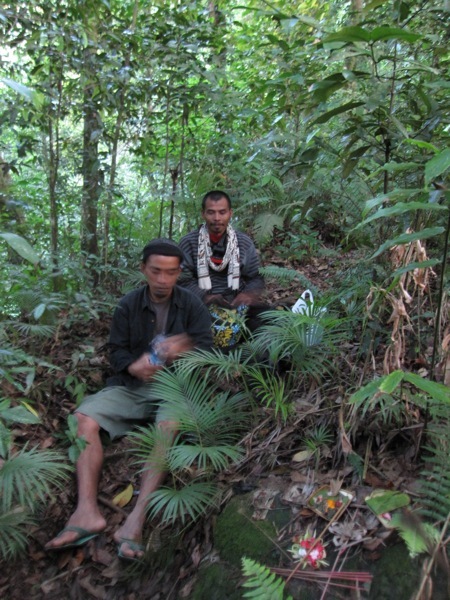 We secured two guides for our hike on Sunday while we were at Prana Dewi. 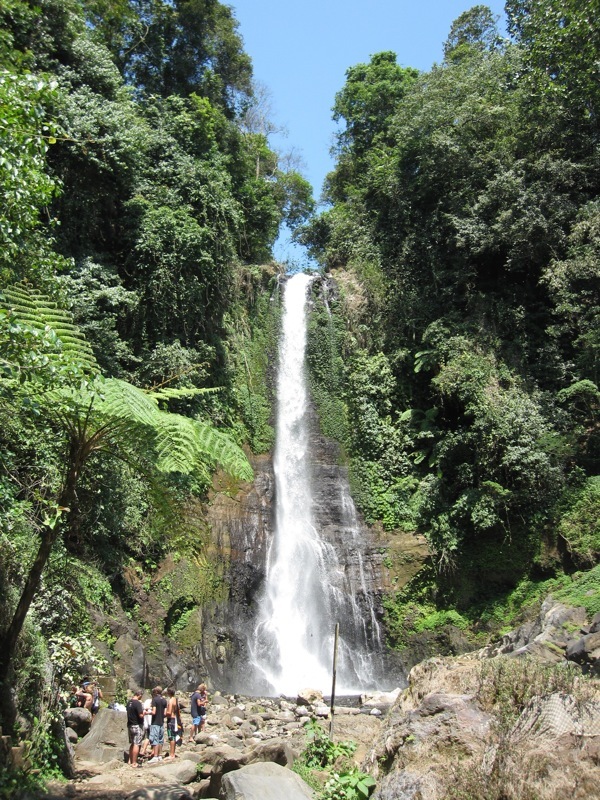 Our trip began on Saturday morning with Gitgit Waterfall as our first destination. It is a gorgeous, thunderous waterfall with a 400 meters drop from the top. We took a refreshing dip at the river and were surprised that only a few people did. To get there, simply look for signs on the main road toward Singaraja that will point you to the various easy trails that lead to Gitgit Waterfall. There are plenty of signs, all of which are clear and easily spotted. Since it is an official tourist destination, there is a ticket fee to get in although it only costs 3,000 IDR, not even half a dollar. We continued our way down to Angseri natural hot springs, a place our driver recommended where we spent a nice afternoon being soaked in calming hot waters surrounded by dense vegetation and rice fields. Prior to this, I didn’t even know that Bali had hot springs, but thanks to my onsen-loving Japanese friend, I now know that there are plenty of hot springs in Bali to choose from and that they are a wonderful and lovely way to spend an afternoon. It was the best way to prepare ourselves for the hike we were to embark the next day. Mt. Batukaru is 2,275 meters above sea level, and the trail to the peak begins at a temple called Pura Luhur Batukaru. Guidebooks say it takes about eight hours to reach the peak and back down, but I think that time duration highly depends on experience. We had two inexperienced hikers in our group of four (I have really only done one hike before this one), so for us the hike took more like ten hours, including lunch at the peak. One person in our group didn’t even make it to the peak because she felt unwell and headed back down with one of the guides while the rest of us continued on upward. And because the forest is so dense and sunlight barely ever touches the ground, at times the trail can be very dangerous and slippery even though we hiked during the dry season. Oftentimes, the trail seemingly just disappeared as if we were forging a new path to the peak. I cannot stress how vital it is to go on hikes in the tropics with a guide; by the time any guidebook for hiking in Bali is published, the trails would already have transformed drastically due to the fast-growing vegetation and incredible amount of rain. There’s no way of knowing your way around the trails unless you are on them frequently enough to notice every little change, hence the guides. Except for the guides, we all thought that Mt. Batukaru was a truly challenging hike. However, the guides regularly finish the hike in six hours (four if they run on the way down, they said), and that’s with flip-flops, which they wore the entire time while with us. They told me it was easier for them to hike with flip-flops, and I could understand why they think that while we were on our way back down: my toes were hurting tremendously because they kept hitting the front of my trainers–probably a poor choice for hiking, but I had no better pair of shoes. Unfortunately, due to all that friction on my toes, I had two dead toenails by the time we returned to Pura Luhur Batukaru. My legs felt like rubber for the next several days, and I hope I will never have to go to work again feeling the way I did that following Monday. But I’m extremely happy and proud that I reached the peak of Mt. Batukaru (so proud that I recorded a video) and look forward to going on more hikes! In my next post, I will introduce to you the small island off Bali that even Google Maps doesn’t detect, where I had my best snorkelling experience yet. 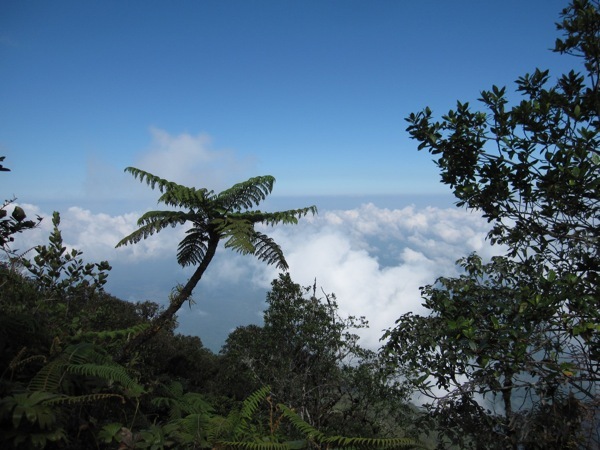 This entry was posted in Bali, Explore and tagged bali hikes, bali hot springs, bali nature scene, cindy. Hot springs in Bali? If only I’d known earlier. Another great reason to return. Yes, there are plenty to choose from. I just went to a different one yesterday that overlooks Lake Batur and the surrounding mountains, AND you can order and sip drinks while inside the hot pools! It’s much pricier, but worth it.